J Cancer Metastasis Treat 2018;4:43.10.20517/2394-4722.2018.24© The Author(s) 2018. Basic Sciences Department, Division of Pharmacology and Toxicology, Ponce Health Sciences University, Ponce Research Institute, Ponce, PR 00732, USA. Centrosomes serve as the major microtubule organizing centers in cells and thereby contribute to cell shape, polarity, and motility. Also, centrosomes ensure equal chromosome segregation during mitosis. Centrosome aberrations arise when the centrosome cycle is deregulated, or as a result of cytokinesis failure. A long-standing postulate is that centrosome aberrations are involved in the initiation and progression of cancer. However, this notion has been a subject of controversy because until recently the relationship has been correlative. Recently, it was shown that numerical or structural centrosome aberrations can initiate tumors in certain tissues in mice, as well as invasion. Particularly, we will focus on centrosome amplification and chromosome instability as drivers of intra-tumor heterogeneity and their consequences in cancer. We will also discuss briefly the controversies surrounding this theory to highlight the fact that the role of both centrosome amplification and chromosome instability in cancer is highly context-dependent. Further, we will discuss single-cell sequencing as a novel technique to understand intra-tumor heterogeneity and some therapeutic approaches to target chromosome instability. Intra-tumor heterogeneity is a cancer hallmark that is characterized by the presence of different cell subpopulations within the same tumor[1,2]. These cell sub-populations foster tumor adaptation and evolution that hinders cancer treatment and leads to tumor recurrence and metastasis[3,4]. Therefore, despite the great conceptual and technological advancements in cancer research, recurrence and metastasis remain a key clinical challenge, making cancer the second leading cause of death in the United States. In this review, we discuss some classical experiments that have enlightened us as to our understanding toward cell cycle and centrosome regulation in order to understand how this modulates cancer initiation, maintenance, progression, and causes intra-tumor heterogeneity. We also discuss other causes of intra-tumor heterogeneity, such as the cancer stem cell theory. We also discuss the single-cell sequencing technique, as a novel technique to understand intra-tumor heterogeneity and relevant therapeutic targets that may aid our understanding of cancer and envision a more effective treatment. Intra-tumor heterogeneity describes the existence of different genetic subpopulations of cells in a given primary tumor. Genetic heterogeneity is studied to determine the transcriptional expression, copy number or mutational/polymorphic status of genes within a tumor to provide an overall tumor genetic composition and determine the best treatment option for patients, which is the basis for personalized medicine. Genetic, epigenetic, and metabolic changes are important contributors to tumor formation and progression. Cancer stem cells, genetic and epigenetic alterations, copy number variation (CMV), single nucleotide variants (SNV), aneuploidy, genome duplication, and chromosome instability can initiate and sustain cancer progression and genetic heterogeneity. Intra-tumor heterogeneity supports the theory of clonal evolution that has been forced by selective pressures such as those exerted by chemotherapy or radiotherapy. It is generally accepted that all cancer types display some degree of intratumoral heterogeneity, with thyroid and prostate cancers showing less heterogeneity, and cancers that include lung, stomach, glioblastomas and melanomas displaying a high degree of intratumoral heterogeneity. In fact, transcriptomic and genomic profiling of multi-spatial biopsies of glioblastomas, medulloblastomas and renal cell carcinomas demonstrated that cells within a single tumor were rarely clonal, thus explaining single-agent therapy failure in cancers. Genetic heterogeneity determines the fate of metastasis, with highly heterogeneous cancers such as colon displaying highly heterogeneous metastases within the same patient. On the other hand, many high-grade serous ovarian cancers of patients with metastases are clonal, and most metastases originate from one clone. Breast cancers are excellent examples of the role played by genetic heterogeneity in survival outcomes of affected patients. Breast cancers are classified using mRNA expression microarrays and/or with several pathological markers, including the epidermal growth factor 2 (Her2), the estrogen receptor (ER), or the progesterone receptor (PR). The classification includes Luminal A (ER+PR+Her2-), Luminal B (ER+PR+ and Her2+ or Her2-), Her2+ (ER-PR-Her2+) and basal (which includes 76% triple-negative breast tumors, ER-PR-Her2-). Luminal A breast cancer patients show the best survival of all breast cancer patients, followed by Luminal B, Her2+ and basal[10,11]. More recent studies show that hormone receptor-negative breast tumors (Her2+ and basal) display more chromosome instability and centrosome amplification (defined as the acquisition of three or more centrosomes that promote the formation of a bipolar mitotic spindle and equal segregation of chromosomes following mitosis) than luminal subtypes[12,13]. Also, Her2+ and triple-negative basal breast cancer patients that initially respond to chemotherapy tend to relapse more readily than luminal breast cancer patients if residual disease remains. Molecular subtypes also determine the preferred metastatic sites of breast cancer cells, since Luminal subtypes are more likely to invade the bone, and basal subtypes are more likely to invade into the lung. The differences in survival outcomes between luminal and hormone receptor-negative breast cancers can be explained by the plethora of treatments available to treat luminal patients (including tamoxifen, Cdk4/Cdk6 and aromatase inhibitors). Nevertheless, the differences in survival can only be partly explained by differences in treatments available, since similar treatments are available for Luminal A and Luminal B breast cancers, and yet Luminal B breast cancers have poorer survival. We speculate that the higher relapse rates are due to the close relationship between aneuploidy, chromosome instability, and chemotherapy resistance[17,18]. G12D, v-Ras, H-RasV12 and c-Myc[25-29]. More recent data by the Pellman group has shown that evolution can also occur from single, catastrophic events[30,31]. One of such mechanisms is known as chromothripsis, which is caused by the fragmentation and rearrangements of whole chromosomes contained in micronuclei (defined as missegregated whole chromosomes). Interestingly, centrosome amplification and failure of the spindle assembly checkpoint frequently cause whole chromosome losses[26,27,32-35], implying that they may represent primary causes of these catastrophic events. Genetic mutations not only drive cancer initiation and progression but can sustain cancer cell survival by modulating the metabolism that supplies the high demand of building blocks required by cancer cells. For example, it has been reported that the transcription factors p53, c-Myc, and HIF can induce the expression and activity of glucose transporters involved in glycolysis and the hexose monophosphate shunt to fuel the TCA cycle. Moreover, fatty acid β-oxidation is expressed differently in glioblastoma subtypes; this generates a different response to drug treatment and leads to lipid mobilization to generate more energetic compounds and building block for cancer development and progression. This adaptation to the environment does not only create an effect in the microenvironment surroundings but also alters the response to therapy by creating cells resistant to chemotherapy. 6) cancer cells that circulate in the peripheral blood[39,41] and colonize adjacent tissues; thus contributing to tumor progression. External pressures create a microenvironment that changes the phenotypic and behavioral development of a tumor. This reasoning provides an initial explanation of drug resistance and metastasis initiation between patients with the same type of cancer[5,39]. The external pressures can be inflammatory responses, radiotherapy, or cytotoxic chemotherapy[19,42,43]. The microenvironment surrounding a tumor can also influence tumor fate. In a recent example, the genetic ablation of the E2F3 transcription factor in macrophages suppresses mammary tumor metastasis into the lungs, but not mammary tumor growth, suggesting that proper macrophage functions and specific microenvironments maintain specific cancer cell functions. We discussed in the previous section that cancer stem cells, and changes in genetic and metabolic pathways in whole populations and single cells triggered by chromosome instability generate heterogeneity in cancer cell subpopulations. Even then, these cancer-cell subpopulations are limited in their functionality by distinct microenvironments or physical barriers, and tumor cells adapt to overcome these barriers. This confers adaptive tumor features and generates CTCs. Due to their critical role in intra-tumor heterogeneity, CTCs are well studied by single-cell sequencing. CTCs are found as clusters that reflect the intra-tumor heterogeneity and the potential capacity to initiate metastasis. Alternatively, CTCs can differentiate into different single cells from the initial tumor, thus increasing intra-tumor heterogeneity. Therefore, CTCs can serve as a diagnostic and evolutionary component to a better-targeted therapy[45-48]. The most recent technique to study tumor heterogeneity is single-cell sequencing (SCS). SCS is based on the principles that govern the next generation sequencing (NGS) technique. However, SCS is more informative than NGS because it reveals information from a single cell instead of making a pool of several cells that may have a heterogeneous genome and thus affect the results. The SCS procedure can be divided into two stages: single cell isolation and cell genomic profiling. Single cells can be obtained by the use of fluorescence-activated cell sorting (FACS), laser-capture microdissection (LCM), and micromanipulation. Out of these, FACS appears to be the most efficient and easier to perform. After obtaining the single cell, single-cell genomic sequencing or single-cell transcriptomic sequencing can be done. Single-cell genomic sequencing or single nuclear genome sequencing is useful to study mutations, single nucleotide variations, and indels (insertion and deletions). Multiple methods of SCS for single nuclear genome have been designed [Table 1]. One of such variants is the DOP-PCR, in which the amplification of the sequences is started with primers that in the 5’-3’ ends have six possible ACTG combinations, which allow the hybridization of the template with the single cell DNA. This amplification of the sequences generates a database that is used to assess copy number assessment[39,41,51]. Another type of DNA sequencing of single cells is the multiple displacement amplification (MDA). This technique is characterized by not having a PCR phase amplification; instead denaturalized DNA from single cells are exposed to anneal with hexamer primers, synthesizing new DNA strands. This type of sequencing is a better tool to detect mutations in the DNA strands. Another is the multiple annealing and looping-based amplification cycles (MALBAC) that amplify the original single cell DNA strand. Creating a database that is useful for the detection of copy number variants (CNV). An aspect that differentiates all of these types of SCS is the generation of artifacts, false positive and false negative results that can affect the application of the proper algorithm to determine if the changes are significant of the population heterogeneity at the level of single nucleotide variants (SNV). On the other hand, single-cell transcriptomic sequencing or whole transcriptome sequencing can be used to study the genetic network regulation in a certain cell subpopulation. Also, it can be useful to detect alternative splice sites, novel exons, retained introns, coding RNAs, and non-coding RNAs, among others[39,41,50]. Most of the sequencing protocols in cancer research use the whole transcriptome amplification (WTA). WTA uses reverse transcriptase to transform mRNA to cDNA via PCR amplification. This method was first used by Tang and colleagues, and they used an oligo-dT primer at 5’ and in the 3’ they added a poly-A tail in the cDNA, generating data to detect alternative splice sites in the mRNA, generation of novel exons in the CTCs and genetic variants in the strand. Two main variants have been developed, Smart-Seq and Smart-Seq2, which differ in the 5’ end primer of the strand[57,58]. Later, Quartz-seq was developed to detect the heterogeneity of gene expression between groups of SCS methods. This method reduces the amplification to detect expression of genes in different single cells types. Cell expression by linear amplification and sequencing (Cel-Seq and Cel-Seq2) uses the method of molecular barcoding to identify different single cells in a pool of cells[60,61]. Despite the cost-effectiveness of the technique, it remains under- development. Single cell tagged reverse transcription (STRT) is a type of sequencing that quantifies the 5’ mRNA gene expression in single cells, that is capable of locating promoters and enhancers. One of the latest is the Drop-Seq and Indrop-Seq by Islam et al. in which thousands of cells in a droplet are sequenced by using a wrapped unique barcode. Another method has been developed from fixed cells, and additional transcriptome and methylome analyses have been studied to determine changes in expression of RNA in single cells[47,63]. Several other variants are exemplified in Table 2 and reviewed in more details elsewhere. Despite being a time-consuming technique that requires multiple sampling and cannot be used to make generalizations, SCS can be used to diagnose rare tumor cells, detect earlier metastatic malignancies in CTCs, and study tumor heterogeneity. Even though this technique provides high replicability can have a high generation of false-positive or negatives or sequencing bias, affecting the applicability of the technique to drug treatment and diagnosis. Understanding tumor heterogeneity can help improve current cancer treatments through precision medicine. Take for example breast cancer, which has been classified at least 18-21 subtypes with unique histological and molecular characteristics; yet therapy is delimited to the ER, PR, Her2 criteria. Since tumor heterogeneity leads to chemotherapy resistance, SCS can help detect rare genotypes that may be an aid in this process. Tumor heterogeneity may also confer some adaptive features to the tumor through distinctive biomarkers, so SCS can also help identify such biomarkers to improve current treatment selection and move forward into precise medicine. Over 100 years ago, Theodor Boveri coined the term centrosome (independently and simultaneously discovered and called corpuscle central by van Beneden) and hypothesized that centrosome aberrations leading to abnormal mitosis and abnormal chromosome constitutions may contribute to malignant tumors. Since then, our laboratory and those of others have worked towards the elucidation of the mechanisms and consequences of centrosome aberrations in tumor initiation and progression. The centrosome is a small organelle composed of a pair of centrioles surrounded by pericentriolar material (PCM) that serves as the principal microtubule organizing center of vertebrate cells. The centrosome duplicates only once to ensure proper spindle formation and equal chromosomal segregation during mitosis[82,83]. In order to maintain chromosome stability, the centrosome duplication cycle and the cell cycle must be tightly coordinated[84-88]. Laser ablation and microsurgical removal demonstrated that some immortalized mammalian cells (hTERT-RPE and -HMECs) can cycle without centrioles/centrosomes; however, some epithelial cells like BSC-1 African green monkey kidney cells go through G1 much more slowly or not at all if centrosomes are removed[89,90]. Centrosome removal sensitizes cells to various external stimuli such as blue light, which results in p53-dependent G1 arrest. Similarly, silencing of 14 (out of 15) centrosome components arrests cells in G1 by activating p53, p21, p38, and inactivation of cyclin A-Cdk2 activity. -/- mouse embryonic fibroblast did not achieve centrosome separation at G1/S, while these with a cdk2-/- genotype achieved premature separation, and the premature separation defect was exacerbated in cdk2-/-cdk4-/- mouse embryonic fibroblasts. Early studies from the Nigg’s group demonstrated that centriole duplication requires the activation of E2F transcription factors and the activity of the Cdk2-cyclin A complex, and the Leone laboratory demonstrated that repression by E2F3 played a major role in preventing premature centriole duplication, centrosome amplification, and chromosome instability by controlling cyclin E levels and cyclin E-dependent kinase activity. Although it is not entirely clear how the E2F activators (E2F1, E2F2 and E2F3a) control centrosome duplication, our laboratory has shown that the E2F activators control the transcription, protein stability, and protein levels of many targets that regulate the centrosome cycle and mitosis, including cyclin E, Rb, Plk4, Nek2, Mps1, SgoL1, and cyclin B[35,109,110]. Albeit elucidating the entire centrosome duplication cycle is still a work in progress, much is now known about the cellular events controlling it, recently reviewed by Nigg and Holland. Centriole assembly is controlled by phosphorylation of Ana2/STIL by Plk4; this event recruits Ana2 and Sas6 to initiate procentriole formation[112,113]. Centriole biogenesis is controlled by interactions between Cdk2 and the SKP1-Cullin-F-box E3 ligase βTrCP, where Cdk2 protects STIL from degradation by βTrCP; STIL then interacts with CPAP to complete centriole duplication. Cdk2 also controls the degradation of Mps1 in centrosomes to control centriole duplication. Aurora kinase A (AURKA) is essential to the formation of a bipolar mitotic spindle by regulating centrosome separation. The AURKA phosphorylation of Cdk1-cyclin B at G2 recruits the former to centrosomes, where it is activated to initiate mitotic entry. Centrosome localization of Cdk1 and inhibition of Chk1 is present in mitosis to prevent premature activation of the Cdk1-cyclin B complex. Accordingly, PLK1 regulates centrosome maturation, centrosome disjunction through NEK2, and centrosome microtubule-attachments. Also, NEK2 regulates centrosome separation by phosphorylating and inactivating c-Nap1 and β-catenin[123,124]. Lastly, from metaphase to anaphase, the two centrosomes migrate to opposite cellular poles and form the mitotic spindle to which the kinetochore will attach. Faithful segregation of chromosomes is ensured by the spindle assembly checkpoint (SAC) and associated proteins such as BUB1B, MPS1, among others. Other proteins that play important functions in chromosome integrity include Bub1, which maintains sister chromatid cohesion through the phosphorylation of SgoI; another protein that plays a key role in this activity is PP2A, which ensures localization of Sgo1 to centromeres. Aurora kinase B, survivin, and ICENP play important roles in cytokinesis [Figure 1]. Deregulation of the centrosome duplication cycle results in centrosome aberrations and chromosome instability that ultimately have an effect on tumorigenesis[87,88,130]. While centrosome aberrations are traditionally associated with cancer, mutations in genes that codify for centrosome proteins are also known to cause human diseases such as ciliopathies (e.g., autosomal recessive primary microcephaly, Bardet-Biedl disease, polycystic kidney disease, and primary ciliary dyskinesia). Centrosome aberrations are classified as numerical and structural. Both aberrations co-occur in tumors[133,134]. Centrosome aberrations have been identified in most cancer types. For example, pioneering studies from the Doxsey laboratory demonstrated structural abnormalities in number, position, shape, and size of centrosomes in primary solid tumors, including brain, breast, colon, lung, and prostate. Likewise, studies from the Salisbury laboratory showed that breast cancer tissue displayed abnormal structural and numerical centrosome aberrations, abnormal mitoses and chromosome instability relative to normal breast tissue[133,135,136] and that centrosome amplification in breast cancers is indicative of tumor aggressiveness. Centrosome amplification is defined as an excess of normal components, specifically more than two centrosomes and more than four centrioles. Centrosome amplification results in multipolar or pseudobipolar mitotic spindles that may culminate in aneuploidy and chromosome instability. Also, centrosome amplification may lead to defects in cytokinesis that lead to tetraploidy. Because tetraploidy and excess chromosome instability are associated with decreased cellular fitness[140,141], cells with amplified centrosomes avoid cell death by clustering centrosomes in order to avoid the generation of multipolar mitosis, and excessive aneuploidy and chromosome instability[142,143]. However, cells with pseudobipolar spindles form merotelic attachments that lead to single chromosome gains and losses. Either tetraploidy or single chromosome losses have been shown to be tumorigenic in mouse models of cancer[145,146]. In a more recent study, Sabino et al. demonstrated that Drosophila melanogaster epithelial wing disc cells overexpressing Sak display extra centrosomes and exhibited mechanisms of clustering, but also inactivation of extra centrosomes. Inactivation of extra centrosomes is defined as the gradual loss of microtubule-nucleating capacity. Although inactivation culminates in normal spindle bipolarization, neither clustering nor inactivation was efficient and abnormal segregation was observed. Furthermore, epithelial cells with extra centrosomes generated tumors when transplanted into the wild-type host. G12D in mammary epithelial cells, which resulted in pre-malignant mammary epithelial lesions with centrosome amplification that preceded mammary tumors. In mice, centrosome amplification induced by Plk4 accelerates the time of onset of lymphomas and sarcomas associated with loss of p53, and of skin tumors in p53-deficient epidermis. More recently, Levine et al. used a mouse model of intestinal neoplasia with a single truncated allele of the adenomatous polyposis coli (APCMin) tumor suppressor and generated a doxycycline-inducible mouse model exhibited increased levels of PLK4 (APCMin/+; Plk4Dox), which resulted in centrosome amplification and aneuploidy. Notably, the APCMin/+; Plk4Dox exhibited higher intestinal tumor incidence compared to the APCMin but no greater tumor burden. Therefore, these results demonstrate that centrosome amplification has a role in tumor initiation but not in tumor progression. To investigate if centrosome amplification can drive spontaneous tumorigenesis, Levine et al. also developed a ROSA26-rtTA; tetO-Plk4 mouse model that expressed Plk4 in multiple mouse tissue upon doxycycline treatment. These mice developed lymphomas, squamous cell carcinomas, and sarcomas that exhibited aneuploidy. However, it is still unknown why some tissue efficiently develop tumors, where others do not. Perhaps this is due to the high levels of centrosome amplification induced in these models, since high-level chromosome instability and aneuploidy affect the fitness of tumor cells, since they die, or stop proliferating after a few cell cycles[140,141]. + breast cancer cells downregulated for E2F3 by overexpressing GFP-Nek2 induced invasive protrusions in 3D culture. The Aneja’s laboratory also showed that induction of centrosome amplification by overexpression of Plk4 in MCF10A cells induced higher migration that correlated with vimentin expression. Experiments done by Denu expressing Plk4 in non-transformed MCF10A mammary epithelial cells demonstrated that acute acquisition of centrosome amplification resulted in de-differentiation of cells, where CD24 levels were reduced, and CD44 increased, suggesting that these cells were acquiring stem-cell features. While the role of centrosome amplification in cancer is more clearly defined, the role of structural aberrations has been unclear until recently. Structural centrosome aberrations are defined as changes in size and composition of the pericentriolar matrix without changes in the number of centrioles. Overexpression of Ninein-like protein (Nlp), a protein that is involved in microtubule nucleation causes structural centrosome aberrations leading to spontaneous tumors in mice, including breast, ovary, and testicle. The latest result from the Zhan laboratory is highly relevant to human disease since Nlp is overexpressed in breast, lung, ovarian, and squamous head and neck cancers[165-167]. Interestingly, structural centrosome aberrations lead to similar phenotypes as centrosome amplification, albeit by a non-cell autonomous mechanism, since overexpression of Nlp contributes to invasion by causing stiffness in epithelial cells that culminate in budding out of the acinar structures mitotic cells that do not contain centrosome aberrations. Together, these experiments suggest that centrosome amplification and structural aberrations can contribute to aggressive features of tumors by inducing invasion, increased grade/stage, and more stem-like features of cells. The studies above suggest that the effects of centrosome amplification in tumor cells appear to be context dependent. The Vande Woude group first identified the mechanism by which centrosome amplification is generated in tumors by showing that mouse embryonic fibroblasts lacking p53 displayed centrosome amplification. Later on, other groups demonstrated that centrosome amplification was triggered by the loss of tumor suppressors that include APC, BRCA1, and BRCA2. Regarding the mechanism, in p53-null mouse embryonic fibroblasts, silencing or genetic ablation of Cdk2 and Cdk4 suppressed centrosome amplification. Also, centrosome amplification in Brca1- or GADD45- deficient cells was associated with the downregulation of Nek2. Several studies revealed oncogenes could also drive centrosome amplification. For example, v-RAS drives centrosome amplification through the MAPK pathway[26,173]. Further, H-RasG12V and H-RasG12V, and c-Myc drive centrosome amplification through cyclin D1, Cdk4, and Nek2 in the non-transformed mammary epithelial cells MCF10A. Likewise, Her2+ breast cancer cells require Cdk4 and Nek2 to signal centrosome amplification and chromosome instability. Further, the inhibition of Cdk2 suppressed Aurora A-induced centrosome amplification in MCF7 breast cancer cells with inactive p53 by preventing the localization of Aurora kinase A to centrosomes. However, not all oncogenes induce centrosome amplification as means to initiate tumors, despite the induction of proliferation and apoptosis in pre-malignant mammary epithelial lesions by c-Myc; the pre-malignant lesions were devoid of centrosome amplification. Nevertheless, c-Myc eventually induced centrosome amplification in mammary tumors, suggesting that c-Myc requires other genetic or epigenetic alterations to induce this abnormal process in mammary tumors. There has been vast evidence demonstrating the essential role of the RB/E2F pathway in cell cycle regulation and centrosome duplication, a pathway that is unregulated by oncogenes such as Ras and Myc. For example, acute loss of Rb causes centrosome amplification. Although the E2F transcriptional factors have redundant functions, each member of the family also has unique functions. Take for example E2F3, whose loss in mouse embryonic fibroblasts results in unregulated cyclin E-dependent kinase activity, defects in nucleophosmin B association with centrosomes, and premature centriole separation and duplication that result in centrosome amplification, mitotic spindle defects, and aneuploidy. On the other hand, genetic ablation of E2F1, E2F2, E2F4 or E2F5 does not cause centrosome amplification. Also, silencing E2F1 or E2F3 in Her2+ breast cancer cells suppresses centrosome amplification, while overexpression of E2F1, E2F2, or E2F3a in MCF10A cells is sufficient to trigger centrosome amplification and chromosome instability. Chromosome instability is a broad term that refers to chromosome segregation errors, which results in chromosome losses or rearrangements. 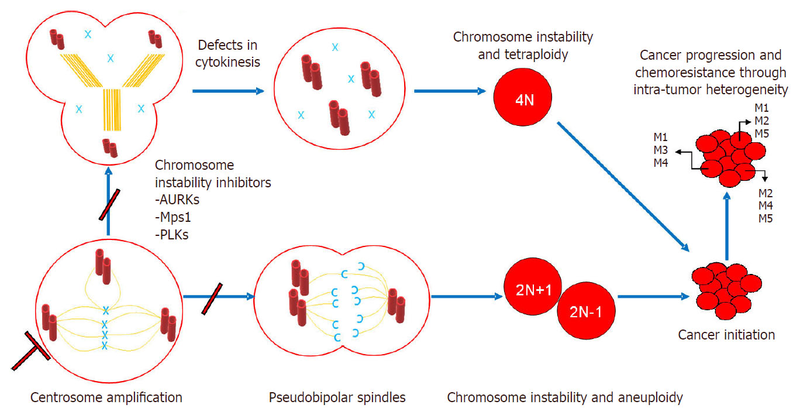 As reviewed elsewhere, chromosome instability can occur as a consequence of mitotic checkpoint defects, aberrations in centrosome duplication cycle, altered kinetochore function, microtubule attachment defects, chromosome cohesion defects, and mutations causing or allowing genomic instability. Although it has been shown that centrosome amplification leads to chromosome instability, a recent study from Kuznetsova et al. showed that chromosome instability, tolerance of mitotic errors, and multidrug resistance can be promoted by tetraploidization in human cells without centrosome amplification. This study demonstrated that chromosome instability was tolerated by mutations in p53 and the downregulation of the pro-apoptotic factors iASPP and cIAP2. Even though it remains a question whether centrosome amplification is a cause or an effect of chromosome instability, both have been shown to occur exclusively in malignant tumors that display aneuploidy and are associated with tumor recurrence, metastasis[181,182], and drug resistance[18,183,184]. Aneuploidy is defined by gains or losses of whole chromosomes that play a role in tumor initiation, maintenance, and progression. Aneuploidy, as a consequence of chromosomal instability, along with genomic instability (defects in DNA damage detection and repair) lead to intra-tumor heterogeneity. Chromosome instability occurs exclusively in malignant tumors that display aneuploidy; chromosome instability affects tumor progression by generating tumor heterogeneity[181,182]. For example, chromosome instability has been shown to maintain tumor heterogeneity in glioma cells. A more recent study showed that chromosome missegregation drives tumor heterogeneity in glioma cells; cells with double minute chromosomes were more radio-resistant than those without them. Upon irradiation, the double minute chromosomes allowed glioma cells to invade and become angiogenic. Thus, in that setting, tumor heterogeneity generated by the loss and gains of double minute chromosomes may hinder cancer treatment by increasing cell invasiveness and radio-resistant cells. Several studies have shown that chromosome instability also contributes to chemotherapy resistance[18,183,184,187], making chromosome instability a good therapeutic target. However, it is noteworthy that there is a complex relationship between chromosome instability and therapeutic response that depends not only on the chromosome instability level, but also in the genetic context and tissue type. As an example, a study conducted by Heerema et al. found that trisomies of chromosome 4 and 6 did not affect prognosis in patients with high hyperdiploid acute lymphoblastic leukemia, while concurrent trisomies of chromosomes 10 and 17 were associated with a better prognosis and trisomies of chromosome 5 was correlated with a worse prognosis. Later on, in this manuscript, we describe two approaches to target chromosome instability clinically. The first is by targeting some key proteins involved in the centrosome duplication cycle to decrease chromosome instability. The second approach aligns more with the notion that the cell will tolerate a certain level of chromosome instability and beyond that the cell will not be viable. Therefore, this approach aims to elevate chromosome instability levels to induce cell cycle arrest or apoptosis. Before reviewing the clinical applications of chromosome instability, we will review the molecular implications of chromosome instability as a driver of intra-tumor heterogeneity. Given the numerous mechanisms attributed to chromosomal instability, several approaches have been proposed to target chromosome instability in cancer. One approach is to target centrosome-associated proteins that regulate microtubule dynamics and the SAC to prevent centrosome amplification, thus preventing chromosome instability[87,189,190]. The Cdk4/Cdk6 inhibitor Palbociclib (PD-0332991) in combination with the aromatase inhibitor letrozole has greatly improved the outcomes of ER+, Her2- advanced breast cancer patients[191,192]. Albeit that study did not measure centrosome amplification and chromosome instability, it is tempting to propose this as an approach to suppress active generation of these processes in cancer cells, since we have shown that silencing or genetic ablation of Cdk4 in p53-null fibroblasts, in mammary epithelial cells expressing H-RasG12V or H-RasG12V and c-Myc, or in Her2+ breast cancer cells suppress these processes[25,104,174]. However, this approach neglects the fact that chromosome instability may occur by multiple mechanisms and multiple dysregulated proteins. In fact, Palbociclib is ineffective in basal breast cancer cells (the subtype with a higher degree of chromosome instability), and patients are harboring alterations in the Rb/E2F pathway[193,194]. Nevertheless, several inhibitors targeting polo-like kinases (Plks) and Aurora kinases (AURKs) have been tested in pre-clinical and clinical trials with mixed outcomes, and this has been extensively discussed elsewhere. Notably, the inhibitor MLN8237 (Asertib) that targets AURKs exhibited efficacy for several solid tumors and T-cell lymphoma, but not acute myeloid leukemia[195,196]. The opposite was observed for the selective inhibitor of AURKB, AZD1152 (Barasertib). Another strategy to kill tumor cells is to elevate chromosome mis-segregation. It has been proposed that there is an optimal level of chromosome instability for tumor maintenance and progression; beyond that level chromosome instability becomes detrimental for cancer cells[12,184]. For example, elegant experiments from the Sluder laboratory demonstrated that the acquisition of tetraploidy in most immortalized or cancer cells they investigated resulted in cell cycle arrest within a few cell cycles. Also, the Cleveland group demonstrated that while low-level aneuploidy triggered by the loss of one copy of Cenp-E was tumor promoting in mice, aneuploidy can also be tumor-suppressive. A recent pan-cancer analysis of genetic heterogeneity in cancer done by the Malley group showed that in general, cancers with intermediate levels of chromosome instability (measured by copy number variation analysis) had worst prognosis than cancers with low or high levels of instability. However, their relationship varied depending of the adjuvant treatment given, suggesting that radiotherapy and adjuvant chemotherapy may be effective in treating cancers with intermediate chromosome instability by pushing the limits of tolerable chromosome instability. The Swanton’s group also provided clinical evidence to support this hypothesis with their retrospective study conducted in a cohort of 246 primary breast cancer patients. The study showed that extreme chromosome instability (measured with chromosome-specific markers and aCGH and correlated to the CIN70 score, MammaPrint, and GGI) correlated with improved long-term survival in ER-negative breast cancer patients; exhibiting a non-monotonic correlation. This observation was confirmed in a study involving a larger cohort of ER- patients. However, a linear correlation was observed in ER-positive breast cancer patients and extreme chromosome instability; the same relationship was found with glioblastomas. Thus, we have to be careful with proposing increasing chromosome instability as a strategy against cancer, since it is tumor suppressive in some cancers, and tumor promoting in others. Mitotic kinases contribute to chemotherapy resistance, as illustrated by Janssen et al., who demonstrated that the reduction of essential levels of Mps1 and BubR1 sensitized several tumor cells to clinically relevant doses of paclitaxel (an anti-mitotic drug commonly used in cancer treatment). On the other hand, inhibition of these kinases did not induce cell death in normal cells. Currently, a Mps1 inhibitor is being tested in clinical trial Phase 1 (BAY1161909) in triple negative breast cancer patients. In this clinical trial, the Mps1 inhibitor is administered along with paclitaxel (a microtubule-interfering agent) to induce tumor death by increased chromosome mis-segregation. A similar approach can be tested with the combination of paclitaxel and BubR1, Hec1, Nek2, or Sgol1 inhibitors because all of these proteins play an important role in proper SAC functioning and our studies have demonstrated their role in centrosome amplification and chromosome instability downstream of the E2F activators[35,162,201]. Additionally, a study by Lee et al. ranked 62 different anticancer drugs for their capacity to induce chromosome instability. The drugs evaluated in this study have several mechanisms of action (e.g., antimicrotubule activity, DNA replication and damage response, mitotic checkpoint inhibition, etc.) and can be evaluated in combination with inhibitors of centrosome-associated proteins to see if the effect of increase chromosome instability is potentiated. Thus, these findings present us with multiple possibilities that together with advances in precise medicine and technologies such as SCS can be explored in cancer patients with specific tumor genotype/phenotype (intra-tumor heterogeneity) to develop better treatment. Failure to properly regulate the cell cycle and the centrosome cycle leads to centrosome aberrations. One of such centrosome aberrations is centrosome amplification, which occurs in various cancer types. In our model depicted in Figure 2, we summarize two known mechanisms that denote the role of centrosome amplification in tumor initiation, maintenance, progression, and chemo/radio-resistance through intra-tumor heterogeneity. One mechanism shows that centrosome amplification results in multipolar or pseudobipolar mitotic spindles that may culminate in aneuploidy and chromosome instability, thus contributing to intra-tumor heterogeneity. The other mechanism shows how defects in cytokinesis lead to tetraploidy and chromosome instability. This mechanism also promotes tumor initiation, maintenance, progression, and chemoresistance through intra-tumor heterogeneity. The reader should also keep in mind that centrosome aberrations may contribute to malignant phenotypes in cancer such as invasion through changes in polarity, and such phenotypes occur independently of chromosome instability. However, the role of centrosome amplification in tumorigenesis needs to be further elucidated in human tumors because it has been shown that centrosome aberrations are highly context-dependent and several other mechanisms may apply. Another aspect that is worth studying in the future is the effect of functional centrosome aberrations (microtubule nucleation, disorganized mitotic spindle, etc.) and other structural centrosome aberrations such as changes in shape, size position, and composition in cancer. Also, clustering mechanisms and normal spindle bipolarization through extra chromosome inactivation and how these vary in cancer. Nevertheless, proper classification of centrosome aberrations in human tumors might have a diagnostic or prognostic value. Therefore, it would be beneficial to explore the therapeutic applications of chromosome instability in cancer. As reviewed here, chromosome instability inhibitors such as AURKs, Mps1, and PLKs inhibitors can help improve cancer treatment by preventing centrosome amplification and chromosome instability. Another strategy will be to increase chromosome instability levels to promote cancer cell death, but this will be context dependent. For example, this strategy can be used for ER- breast cancers, since extreme chromosome instability correlates with better prognosis in patients with this molecular phenotypes. On the other hand, increasing chromosome instability in ER+ breast tumors is a poor strategy, since there is a direct relationship between increases in chromosome instability and poor survival. In addition, increasing chromosome instability may increase chemotherapy resistance in some patients. SCS can help to address specific genotype that confers cancer cell subpopulations adaptive advantages and impede complete tumor clearance. The advances in both SCS and the identification of putative therapeutic targets are promising toward a complete understanding of cancer and how effective treatment can be achieved. This study was supported by the NIGMS-RISE Training Program (R25GM082406), by PSM-U54-CA163071 and MCC-U54-CA163068 from the National Institutes of Health. The project was also supported by 2U54MD007587 from the PRCTRC, G12MD007579 from RCMI, The Puerto Rico Science, Technology and Research Trust, and Ponce Medical School Foundation Inc. under the cooperative agreement 2016-00026. The content is solely the responsibility of the authors and does not necessarily represent the official views of the National Institutes of Health. 1. Martelotto LG, Ng CK, Piscuoglio S, Weigelt B, Reis-Filho JS. Breast cancer intra-tumor heterogeneity. Breast Cancer Res 2014;16:210. 2. Andor N, Graham TA, Jansen M, Xia LC, Aktipis CA, Petritsch C, Ji HP, Maley CC. Pan-cancer analysis of the extent and consequences of intratumor heterogeneity. Nat Med 2016;22:105-13. 3. Caswell DR, Swanton C. The role of tumour heterogeneity and clonal cooperativity in metastasis, immune evasion and clinical outcome. BMC Med 2017;15:133. 4. McClelland SE, Burrell RA, Swanton C. Chromosomal instability: a composite phenotype that influences sensitivity to chemotherapy. Cell Cycle 2009;8:3262-6. 5. Burrell RA, McGranahan N, Bartek J, Swanton C. The causes and consequences of genetic heterogeneity in cancer evolution. Nature 2013;501:338-45. 6. Morrissy AS, Cavalli FMG, Remke M, Ramaswamy V, Shih DJH, Holgado BL, Farooq H, Donovan LK, Garzia L, Agnihotri S, Kiehna EN, Mercier E, Mayoh C, Papillon-Cavanagh S, Nikbakht H, Gayden T, Torchia J, Picard D, Merino DM, Vladoiu M, Luu B, Wu X, Daniels C, Horswell S, Thompson YY, Hovestadt V, Northcott PA, Jones DTW, Peacock J, Wang X, Mack SC, Reimand J, Albrecht S, Fontebasso AM, Thiessen N, Li Y, Schein JE, Lee D, Carlsen R, Mayo M, Tse K, Tam A, Dhalla N, Ally A, Chuah E, Cheng Y, Plettner P, Li HI, Corbett RD, Wong T, Long W, Loukides J, Buczkowicz P, Hawkins CE, Tabori U, Rood BR, Myseros JS, Packer RJ, Korshunov A, Lichter P, Kool M, Pfister SM, Schuller U, Dirks P, Huang A, Bouffet E, Rutka JT, Bader GD, Swanton C, Ma Y, Moore RA, Mungall AJ, Majewski J, Jones SJM, Das S, Malkin D, Jabado N, Marra MA, Taylor MD. Spatial heterogeneity in medulloblastoma. Nat Genet 2017;49:780-8. 7. Ulintz PJ, Greenson JK, Wu R, Fearon ER, Hardiman KM. Lymph node metastases in colon cancer are polyclonal. Clin Cancer Res 2018;24:2214-24. 8. McPherson A, Roth A, Laks E, Masud T, Bashashati A, Zhang AW, Ha G, Biele J, Yap D, Wan A, Prentice LM, Khattra J, Smith MA, Nielsen CB, Mullaly SC, Kalloger S, Karnezis A, Shumansky K, Siu C, Rosner J, Chan HL, Ho J, Melnyk N, Senz J, Yang W, Moore R, Mungall AJ, Marra MA, Bouchard-Cote A, Gilks CB, Huntsman DG, McAlpine JN, Aparicio S, Shah SP. Divergent modes of clonal spread and intraperitoneal mixing in high-grade serous ovarian cancer. Nat Genet 2016;48:758-67. 9. Perou CM, Sorlie T, Eisen MB, van de Rijn M, Jeffrey SS, Rees CA, Pollack JR, Ross DT, Johnsen H, Akslen LA, Fluge O, Pergamenschikov A, Williams C, Zhu SX, Lonning PE, Borresen-Dale AL, Brown PO, Botstein D. Molecular portraits of human breast tumours. Nature 2000;406:747-52. 10. Sorlie T, Tibshirani R, Parker J, Hastie T, Marron JS, Nobel A, Deng S, Johnsen H, Pesich R, Geisler S, Demeter J, Perou CM, Lonning PE, Brown PO, Borresen-Dale AL, Botstein D. Repeated observation of breast tumor subtypes in independent gene expression data sets. Proc Natl Acad Sci U S A 2003;100:8418-23. 11. Sorlie T, Perou CM, Tibshirani R, Aas T, Geisler S, Johnsen H, Hastie T, Eisen MB, van de Rijn M, Jeffrey SS, Thorsen T, Quist H, Matese JC, Brown PO, Botstein D, Eystein Lonning P, Borresen-Dale AL. Gene expression patterns of breast carcinomas distinguish tumor subclasses with clinical implications. Proc Natl Acad Sci U S A 2001;98:10869-74. 12. Roylance R, Endesfelder D, Gorman P, Burrell RA, Sander J, Tomlinson I, Hanby AM, Speirs V, Richardson AL, Birkbak NJ, Eklund AC, Downward J, Kschischo M, Szallasi Z, Swanton C. Relationship of extreme chromosomal instability with long-term survival in a retrospective analysis of primary breast cancer. Cancer Epidemiol Biomarkers Prev 2011;20:2183-94. 13. Denu RA, Zasadil LM, Kanugh C, Laffin J, Weaver BA, Burkard ME. Centrosome amplification induces high grade features and is prognostic of worse outcomes in breast cancer. BMC Cancer 2016;16:47. 14. Carey LA, Dees EC, Sawyer L, Gatti L, Moore DT, Collichio F, Ollila DW, Sartor CI, Graham ML, Perou CM. The triple negative paradox: primary tumor chemosensitivity of breast cancer subtypes. Clin Cancer Res 2007;13:2329-34. 15. Jin L, Han B, Siegel E, Cui Y, Giuliano A, Cui X. Breast cancer lung metastasis: Molecular biology and therapeutic implications. Cancer Biol Ther 2018; doi: 10.1080/15384047.2018.1456599:1-11. 16. Hu Z, Fan C, Oh DS, Marron JS, He X, Qaqish BF, Livasy C, Carey LA, Reynolds E, Dressler L, Nobel A, Parker J, Ewend MG, Sawyer LR, Wu J, Liu Y, Nanda R, Tretiakova M, Ruiz Orrico A, Dreher D, Palazzo JP, Perreard L, Nelson E, Mone M, Hansen H, Mullins M, Quackenbush JF, Ellis MJ, Olopade OI, Bernard PS, Perou CM. The molecular portraits of breast tumors are conserved across microarray platforms. BMC Genomics 2006;7:96. 17. Sansregret L, Swanton C. The role of aneuploidy in cancer evolution. Cold Spring Harb Perspect Med 2017;7:a028373. 18. Lee AJ, Endesfelder D, Rowan AJ, Walther A, Birkbak NJ, Futreal PA, Downward J, Szallasi Z, Tomlinson IP, Howell M, Kschischo M, Swanton C. Chromosomal instability confers intrinsic multidrug resistance. Cancer Res 2011;71:1858-70. 19. Greaves M, Maley CC. Clonal evolution in cancer. Nature 2012;481:306-13. 20. Nowell PC. The clonal evolution of tumor cell populations. Science 1976;194:23-8. 21. Loeb LA. Mutator phenotype may be required for multistage carcinogenesis. Cancer Res 1991;51:3075-9. 22. Fukasawa K, Wiener F, Vande Woude GF, Mai S. Genomic instability and apoptosis are frequent in p53 deficient young mice. Oncogene 1997;15:1295-302. 23. Tutt A, Gabriel A, Bertwistle D, Connor F, Paterson H, Peacock J, Ross G, Ashworth A. Absence of Brca2 causes genome instability by chromosome breakage and loss associated with centrosome amplification. Curr Biol 1999;9:1107-10. 24. Xu X, Weaver Z, Linke SP, Li C, Gotay J, Wang XW, Harris CC, Ried T, Deng CX. Centrosome amplification and a defective G2-M cell cycle checkpoint induce genetic instability in BRCA1 exon 11 isoform-deficient cells. Mol Cell 1999;3:389-95. 25. Zeng X, Shaikh FY, Harrison MK, Adon AM, Trimboli AJ, Carroll KA, Sharma N, Timmers C, Chodosh LA, Leone G, Saavedra HI. The Ras oncogene signals centrosome amplification in mammary epithelial cells through cyclin D1/Cdk4 and Nek2. Oncogene 2010;29:5103-12. 26. Saavedra HI, Knauf JA, Shirokawa JM, Wang J, Ouyang B, Elisei R, Stambrook PJ, Fagin JA. The RAS oncogene induces genomic instability in thyroid PCCL3 cells via the MAPK pathway. Oncogene 2000;19:3948-54. 27. Saavedra HI, Fukasawa K, Conn CW, Stambrook PJ. MAPK mediates RAS-induced chromosome instability. J Biol Chem 1999;274:38083-90. 28. Felsher DW, Bishop JM. Transient excess of MYC activity can elicit genomic instability and tumorigenesis. Proc Natl Acad Sci U S A 1999;96:3940-4. 29. Weaver ZA, McCormack SJ, Liyanage M, du Manoir S, Coleman A, Schrock E, Dickson RB, Ried T. A recurring pattern of chromosomal aberrations in mammary gland tumors of MMTV-cmyc transgenic mice. Genes Chromosomes Cancer 1999;25:251-60. 30. Meyerson M, Pellman D. Cancer genomes evolve by pulverizing single chromosomes. Cell 2011;144:9-10. 31. Zhang CZ, Leibowitz ML, Pellman D. Chromothripsis and beyond: rapid genome evolution from complex chromosomal rearrangements. Genes Dev 2013;27:2513-30. 32. Wang Y, Jin F, Higgins R, McKnight K. The current view for the silencing of the spindle assembly checkpoint. Cell Cycle 2014;13:1694-701. 33. Tanaka K, Hirota T. Chromosome segregation machinery and cancer. Cancer Sci 2009;100:1158-65. 34. Suijkerbuijk SJ, Kops GJ. Preventing aneuploidy: the contribution of mitotic checkpoint proteins. Biochim Biophys Acta 2008;1786:24-31. 35. Lee M, Rivera-Rivera Y, Moreno CS, Saavedra HI. The E2F activators control multiple mitotic regulators and maintain genomic integrity through Sgo1 and BubR1. Oncotarget 2017;8:77649-72. 36. Cappelletti V, Iorio E, Miodini P, Silvestri M, Dugo M, Daidone MG. Metabolic footprints and molecular subtypes in breast cancer. Dis Markers 2017;2017:7687851. 37. Grande S, Palma A, Ricci-Vitiani L, Luciani AM, Buccarelli M, Biffoni M, Molinari A, Calcabrini A, D'Amore E, Guidoni L, Pallini R, Viti V, Rosi A. Metabolic heterogeneity evidenced by MRS among patient-derived glioblastoma multiforme stem-like cells accounts for cell clustering and different responses to drugs. Stem Cells Int 2018;2018:3292704. 38. Al-Hajj M, Becker MW, Wicha M, Weissman I, Clarke MF. Therapeutic implications of cancer stem cells. Curr Opin Genet Dev 2004;14:43-7. 39. Ellsworth DL, Blackburn HL, Shriver CD, Rabizadeh S, Soon-Shiong P, Ellsworth RE. Single-cell sequencing and tumorigenesis: improved understanding of tumor evolution and metastasis. Clin Transl Med 2017;6:15. 40. Magee JA, Piskounova E, Morrison SJ. Cancer stem cells: impact, heterogeneity, and uncertainty. Cancer Cell 2012;21:283-96. 41. Navin NE. The first five years of single-cell cancer genomics and beyond. Genome Res 2015;25:1499-507. 42. Alizadeh AA, Aranda V, Bardelli A, Blanpain C, Bock C, Borowski C, Caldas C, Califano A, Doherty M, Elsner M, Esteller M, Fitzgerald R, Korbel JO, Lichter P, Mason CE, Navin N, Pe'er D, Polyak K, Roberts CW, Siu L, Snyder A, Stower H, Swanton C, Verhaak RG, Zenklusen JC, Zuber J, Zucman-Rossi J. Toward understanding and exploiting tumor heterogeneity. Nat Med 2015;21:846-53. 43. Ding L, Raphael BJ, Chen F, Wendl MC. Advances for studying clonal evolution in cancer. Cancer Lett 2013;340:212-9. 44. Trikha P, Sharma N, Pena C, Reyes A, Pecot T, Khurshid S, Rawahneh M, Moffitt J, Stephens JA, Fernandez SA, Ostrowski MC, Leone G. E2f3 in tumor macrophages promotes lung metastasis. Oncogene 2016;35:3636-46. 45. Navin N, Kendall J, Troge J, Andrews P, Rodgers L, McIndoo J, Cook K, Stepansky A, Levy D, Esposito D, Muthuswamy L, Krasnitz A, McCombie WR, Hicks J, Wigler M. Tumour evolution inferred by single-cell sequencing. Nature 2011;472:90-4. 46. Wills QF, Mead AJ. Application of single-cell genomics in cancer: promise and challenges. Hum Mol Genet 2015;24:R74-84. 47. Zhu S, Qing T, Zheng Y, Jin L, Shi L. Advances in single-cell RNA sequencing and its applications in cancer research. Oncotarget 2017;8:53763-79. 48. Ting DT, Wittner BS, Ligorio M, Vincent Jordan N, Shah AM, Miyamoto DT, Aceto N, Bersani F, Brannigan BW, Xega K, Ciciliano JC, Zhu H, MacKenzie OC, Trautwein J, Arora KS, Shahid M, Ellis HL, Qu N, Bardeesy N, Rivera MN, Deshpande V, Ferrone CR, Kapur R, Ramaswamy S, Shioda T, Toner M, Maheswaran S, Haber DA. Single-cell RNA sequencing identifies extracellular matrix gene expression by pancreatic circulating tumor cells. Cell Rep 2014;8:1905-18. 49. Navin N, Hicks J. Future medical applications of single-cell sequencing in cancer. Genome Med 2011;3:31. 50. Ren SC, Qu M, Sun YH. Investigating intratumour heterogeneity by single-cell sequencing. Asian J Androl 2013;15:729-34. 51. Gawad C, Koh W, Quake SR. Single-cell genome sequencing: current state of the science. Nat Rev Genet 2016;17:175-88. 52. Dean FB, Hosono S, Fang L, Wu X, Faruqi AF, Bray-Ward P, Sun Z, Zong Q, Du Y, Du J, Driscoll M, Song W, Kingsmore SF, Egholm M, Lasken RS. Comprehensive human genome amplification using multiple displacement amplification. Proc Natl Acad Sci U S A 2002;99:5261-6. 53. Zong C, Lu S, Chapman AR, Xie XS. Genome-wide detection of single-nucleotide and copy-number variations of a single human cell. Science 2012;338:1622-6. 54. Dean FB, Nelson JR, Giesler TL, Lasken RS. Rapid amplification of plasmid and phage DNA using Phi 29 DNA polymerase and multiply-primed rolling circle amplification. Genome Res 2001;11:1095-9. 55. Spits C, Le Caignec C, De Rycke M, Van Haute L, Van Steirteghem A, Liebaers I, Sermon K. Whole-genome multiple displacement amplification from single cells. Nat Protoc 2006;1:1965-70. 56. Tang F, Barbacioru C, Wang Y, Nordman E, Lee C, Xu N, Wang X, Bodeau J, Tuch BB, Siddiqui A, Lao K, Surani MA. mRNA-Seq whole-transcriptome analysis of a single cell. Nat Methods 2009;6:377-82. 57. Picelli S, Bjorklund AK, Faridani OR, Sagasser S, Winberg G, Sandberg R. Smart-seq2 for sensitive full-length transcriptome profiling in single cells. Nat Methods 2013;10:1096-8. 58. Ramskold D, Luo S, Wang YC, Li R, Deng Q, Faridani OR, Daniels GA, Khrebtukova I, Loring JF, Laurent LC, Schroth GP, Sandberg R. Full-length mRNA-Seq from single-cell levels of RNA and individual circulating tumor cells. Nat Biotechnol 2012;30:777-82. 59. Sasagawa Y, Nikaido I, Hayashi T, Danno H, Uno KD, Imai T, Ueda HR. Quartz-Seq: a highly reproducible and sensitive single-cell RNA sequencing method, reveals non-genetic gene-expression heterogeneity. Genome Biol 2013;14:R31. 60. Hashimshony T, Wagner F, Sher N, Yanai I. CEL-Seq: single-cell RNA-Seq by multiplexed linear amplification. Cell Rep 2012;2:666-73. 61. Hashimshony T, Senderovich N, Avital G, Klochendler A, de Leeuw Y, Anavy L, Gennert D, Li S, Livak KJ, Rozenblatt-Rosen O, Dor Y, Regev A, Yanai I. CEL-Seq2: sensitive highly-multiplexed single-cell RNA-Seq. Genome Biol 2016;17:77. 62. Islam S, Kjallquist U, Moliner A, Zajac P, Fan JB, Lonnerberg P, Linnarsson S. Highly multiplexed and strand-specific single-cell RNA 5' end sequencing. Nat Protoc 2012;7:813-28. 63. Esparza-Lopez J, Escobar-Arriaga E, Soto-Germes S, Ibarra-Sanchez MJ. Breast cancer intra-tumor heterogeneity: one tumor, different entities. Rev Invest Clin 2017;69:66-76. 64. Pan X, Durrett RE, Zhu H, Tanaka Y, Li Y, Zi X, Marjani SL, Euskirchen G, Ma C, Lamotte RH, Park IH, Snyder MP, Mason CE, Weissman SM. Two methods for full-length RNA sequencing for low quantities of cells and single cells. Proc Natl Acad Sci U S A 2013;110:594-9. 65. Lee JH, Daugharthy ER, Scheiman J, Kalhor R, Ferrante TC, Terry R, Turczyk BM, Yang JL, Lee HS, Aach J, Zhang K, Church GM. Fluorescent in situ sequencing (FISSEQ) of RNA for gene expression profiling in intact cells and tissues. Nat Protoc 2015;10:442-58. 66. Islam S, Zeisel A, Joost S, La Manno G, Zajac P, Kasper M, Lonnerberg P, Linnarsson S. Quantitative single-cell RNA-seq with unique molecular identifiers. Nat Methods 2014;11:163-6. 67. Pollen AA, Nowakowski TJ, Shuga J, Wang X, Leyrat AA, Lui JH, Li N, Szpankowski L, Fowler B, Chen P, Ramalingam N, Sun G, Thu M, Norris M, Lebofsky R, Toppani D, Kemp DW 2nd, Wong M, Clerkson B, Jones BN, Wu S, Knutsson L, Alvarado B, Wang J, Weaver LS, May AP, Jones RC, Unger MA, Kriegstein AR, West JA. Low-coverage single-cell mRNA sequencing reveals cellular heterogeneity and activated signaling pathways in developing cerebral cortex. Nat Biotechnol 2014;32:1053-8. 68. Klein AM, Mazutis L, Akartuna I, Tallapragada N, Veres A, Li V, Peshkin L, Weitz DA, Kirschner MW. Droplet barcoding for single-cell transcriptomics applied to embryonic stem cells. Cell 2015;161:1187-201. 69. Macosko EZ, Basu A, Satija R, Nemesh J, Shekhar K, Goldman M, Tirosh I, Bialas AR, Kamitaki N, Martersteck EM, Trombetta JJ, Weitz DA, Sanes JR, Shalek AK, Regev A, McCarroll SA. Highly parallel genome-wide expression profiling of individual cells using nanoliter droplets. Cell 2015;161:1202-14. 70. Fan HC, Fu GK, Fodor SP. Expression profiling. Combinatorial labeling of single cells for gene expression cytometry. Science 2015;347:1258367. 71. Fan X, Zhang X, Wu X, Guo H, Hu Y, Tang F, Huang Y. Single-cell RNA-seq transcriptome analysis of linear and circular RNAs in mouse preimplantation embryos. Genome Biol 2015;16:148. 72. Macaulay IC, Haerty W, Kumar P, Li YI, Hu TX, Teng MJ, Goolam M, Saurat N, Coupland P, Shirley LM, Smith M, Van der Aa N, Banerjee R, Ellis PD, Quail MA, Swerdlow HP, Zernicka-Goetz M, Livesey FJ, Ponting CP, Voet T. G&T-seq: parallel sequencing of single-cell genomes and transcriptomes. Nat Methods 2015;12:519-22. 73. Thomsen ER, Mich JK, Yao Z, Hodge RD, Doyle AM, Jang S, Shehata SI, Nelson AM, Shapovalova NV, Levi BP, Ramanathan S. Fixed single-cell transcriptomic characterization of human radial glial diversity. Nat Methods 2016;13:87-93. 74. Hu Y, Huang K, An Q, Du G, Hu G, Xue J, Zhu X, Wang CY, Xue Z, Fan G. Simultaneous profiling of transcriptome and DNA methylome from a single cell. Genome Biol 2016;17:88. 75. Hou Y, Guo H, Cao C, Li X, Hu B, Zhu P, Wu X, Wen L, Tang F, Huang Y, Peng J. Single-cell triple omics sequencing reveals genetic, epigenetic, and transcriptomic heterogeneity in hepatocellular carcinomas. Cell Res 2016;26:304-19. 76. Habib N, Li Y, Heidenreich M, Swiech L, Avraham-Davidi I, Trombetta JJ, Hession C, Zhang F, Regev A. Div-Seq: Single-nucleus RNA-Seq reveals dynamics of rare adult newborn neurons. Science 2016;353:925-8. 77. Nichterwitz S, Chen G, Aguila Benitez J, Yilmaz M, Storvall H, Cao M, Sandberg R, Deng Q, Hedlund E. Laser capture microscopy coupled with Smart-seq2 for precise spatial transcriptomic profiling. Nat Commun 2016;7:12139. 78. Faridani OR, Abdullayev I, Hagemann-Jensen M, Schell JP, Lanner F, Sandberg R. Single-cell sequencing of the small-RNA transcriptome. Nat Biotechnol 2016;34:1264-6. 79. Turner NC, Reis-Filho JS. Genetic heterogeneity and cancer drug resistance. Lancet Oncol 2012;13:e178-85. 80. Boveri T. Concerning the Origins of Malignant Tumors. England: The Company of Biologists Limited and Cold Spring Harbor Laboratory Press; 2007. 81. Bettencourt-Dias M, Glover DM. Centrosome biogenesis and function: centrosomics brings new understanding. Nat Rev Mol Cell Biol 2007;8:451-63. 82. Kellogg DR. Centrosomes. Organizing cytoplasmic events. Nature 1989;340:99-100. 83. Paintrand M, Moudjou M, Delacroix H, Bornens M. Centrosome organization and centriole architecture: their sensitivity to divalent cations. J Struct Biol 1992;108:107-28. 84. Nigg EA. Centrosome duplication: of rules and licenses. Trends Cell Biol 2007;17:215-21. 85. Doxsey S. Duplicating dangerously: linking centrosome duplication and aneuploidy. Mol Cell 2002;10:439-40. 86. Hinchcliffe EH, Sluder G. "It takes two to tango": understanding how centrosome duplication is regulated throughout the cell cycle. Genes Dev 2001;15:1167-81. 87. Harrison MK, Adon AM, Saavedra HI. The G1 phase Cdks regulate the centrosome cycle and mediate oncogene-dependent centrosome amplification. Cell Div 2010;6:2. 88. Fukasawa K. Oncogenes and tumour suppressors take on centrosomes. Nat Rev Cancer 2007;7:911-24. 89. Uetake Y, Loncarek J, Nordberg JJ, English CN, La Terra S, Khodjakov A, Sluder G. Cell cycle progression and de novo centriole assembly after centrosomal removal in untransformed human cells. J Cell Biol 2007;176:173-82. 90. Hinchcliffe EH, Miller FJ, Cham M, Khodjakov A, Sluder G. Requirement of a centrosomal activity for cell cycle progression through G1 into S phase. Science 2001;291:1547-50. 91. Mikule K, Delaval B, Kaldis P, Jurcyzk A, Hergert P, Doxsey S. Loss of centrosome integrity induces p38-p53-p21-dependent G1-S arrest. Nat Cell Biol 2007;9:160-70. 92. Pihan GA, Purohit A, Wallace J, Knecht H, Woda B, Quesenberry P, Doxsey SJ. Centrosome defects and genetic instability in malignant tumors. Cancer Res 1998;58:3974-85. 93. Lingle WL, Lutz WH, Ingle JN, Maihle NJ, Salisbury JL. Centrosome hypertrophy in human breast tumors: implications for genomic stability and cell polarity. Proc Natl Acad Sci U S A 1998;95:2950-5. 94. Chan JY. A clinical overview of centrosome amplification in human cancers. Int J Biol Sci 2011;7:1122-44. 95. Sluder G, Lewis K. Relationship between nuclear DNA synthesis and centrosome reproduction in sea urchin eggs. J Exp Zool 1987;244:89-100. 96. Sluder G. Centrosomes and the cell cycle. J Cell Sci Suppl 1989;12:253-75. 97. Hinchcliffe EH, Li C, Thompson EA, Maller JL, Sluder G. Requirement of Cdk2-cyclin E activity for repeated centrosome reproduction in Xenopus egg extracts. [see comments.]. Science 1999;283:851-4. 98. Hinchcliffe EH, Sluder G. "It takes two to tango": understanding how centrosome duplication is regulated throughout the cell cycle. Genes Dev 2001;15:1167-81. 99. Harrison MK, Adon AM, Saavedra HI. The G1 phase Cdks regulate the centrosome cycle and mediate oncogene-dependent centrosome amplification. Cell Div 2011;6:2. 100. Duensing S. Analysis of centrosomes in human cancer. Methods Cell Biol 2015;129:51-60. 101. Godinho SA, Pellman D. Causes and consequences of centrosome abnormalities in cancer. Philos Trans R Soc Lond B Biol Sci 2014;369:20130467. 102. Okuda M, Horn HF, Tarapore P, Tokuyama Y, Smulian AG, Chan PK, Knudsen ES, Hofmann IA, Snyder JD, Bove KE, Fukasawa K. Nucleophosmin/B23 is a target of CDK2/cyclin E in centrosome duplication. Cell 2000;103:127-40. 103. Tokuyama Y, Horn HF, Kawamura K, Tarapore P, Fukasawa K. Specific phosphorylation of nucleophosmin on Thr(199) by cyclin-dependent kinase 2-cyclin E and its role in centrosome duplication. J Biol Chem 2001;276:21529-37. 104. Adon AM, Zeng X, Harrison MK, Sannem S, Kiyokawa H, Kaldis P, Saavedra HI. Cdk2 and Cdk4 regulate the centrosome cycle and are critical mediators of centrosome amplification in p53-null cells. Mol Cell Biol 2010;30:694-710. 105. Tokuyama Y, Horn HF, Kawamura K, Tarapore P, Fukasawa K. Specific phosphorylation of nucleophosmin on Thr(199) by cyclin-dependent kinase 2-cyclin E and its role in centrosome duplication. J Biol Chem 2001;276:21529-37. 106. Matsumoto Y, Hayashi K, Nishida E. Cyclin-dependent kinase 2 (Cdk2) is required for centrosome duplication in mammalian cells. Curr Biol 1999;9:429-32. 107. Meraldi P, Lukas J, Fry AM, Bartek J, Nigg EA. Centrosome duplication in mammalian somatic cells requires E2F and Cdk2-cyclin A. Nat Cell Biol 1999;1:88-93. 108. 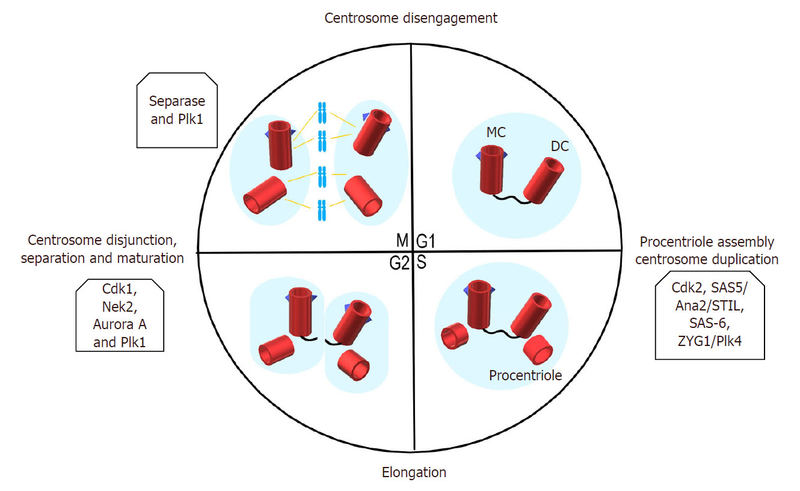 Tsou MF, Stearns T. Mechanism limiting centrosome duplication to once per cell cycle. Nature 2006;442:947-51. 109. Saavedra HI, Maiti B, Timmers C, Altura R, Tokuyama Y, Fukasawa K, Leone G. Inactivation of E2F3 results in centrosome amplification. Cancer Cell 2003;3:333-46. 110. Lee MY, Moreno CS, Saavedra HI. E2F activators signal and maintain centrosome amplification in breast cancer cells. Mol Cell Biol 2014;34:2581-99. 111. Nigg EA, Holland AJ. Once and only once: mechanisms of centriole duplication and their deregulation in disease. Nat Rev Mol Cell Biol 2018;19:297-312. 112. McLamarrah TA, Buster DW, Galletta BJ, Boese CJ, Ryniawec JM, Hollingsworth NA, Byrnes AE, Brownlee CW, Slep KC, Rusan NM, Rogers GC. An ordered pattern of Ana2 phosphorylation by Plk4 is required for centriole assembly. J Cell Biol 2018; doi: 10.1083/jcb.201605106. 113. Dzhindzhev NS, Tzolovsky G, Lipinszki Z, Abdelaziz M, Debski J, Dadlez M, Glover DM. Two-step phosphorylation of Ana2 by Plk4 is required for the sequential loading of Ana2 and Sas6 to initiate procentriole formation. Open Biol 2017;7:170247. 114. Arquint C, Cubizolles F, Morand A, Schmidt A, Nigg EA. The SKP1-Cullin-F-box E3 ligase betaTrCP and CDK2 cooperate to control STIL abundance and centriole number. Open Biol 2018;8:170253. 115. Vulprecht J, David A, Tibelius A, Castiel A, Konotop G, Liu F, Bestvater F, Raab MS, Zentgraf H, Izraeli S, Kramer A. STIL is required for centriole duplication in human cells. J Cell Sci 2012;125:1353-62. 116. Kasbek C, Yang CH, Yusof AM, Chapman HM, Winey M, Fisk HA. Preventing the degradation of mps1 at centrosomes is sufficient to cause centrosome reduplication in human cells. Mol Biol Cell 2007;18:4457-69. 117. Cowley DO, Rivera-Perez JA, Schliekelman M, He YJ, Oliver TG, Lu L, O'Quinn R, Salmon ED, Magnuson T, Van Dyke T. Aurora-A kinase is essential for bipolar spindle formation and early development. Mol Cell Biol 2009;29:1059-71. 118. Hirota T, Kunitoku N, Sasayama T, Marumoto T, Zhang D, Nitta M, Hatakeyama K, Saya H. Aurora-A and an interacting activator, the LIM protein Ajuba, are required for mitotic commitment in human cells. Cell 2003;114:585-98. 119. Kramer A, Mailand N, Lukas C, Syljuasen RG, Wilkinson CJ, Nigg EA, Bartek J, Lukas J. Centrosome-associated Chk1 prevents premature activation of cyclin-B-Cdk1 kinase. Nat Cell Biol 2004;6:884-91. 120. Lane HA, Nigg EA. Antibody microinjection reveals an essential role for human polo-like kinase 1 (Plk1) in the functional maturation of mitotic centrosomes. J Cell Biol 1996;135:1701-13. 121. Mardin BR, Agircan FG, Lange C, Schiebel E. Plk1 controls the Nek2A-PP1gamma antagonism in centrosome disjunction. Curr Biol 2011;21:1145-51. 122. Spankuch-Schmitt B, Bereiter-Hahn J, Kaufmann M, Strebhardt K. Effect of RNA silencing of polo-like kinase-1 (PLK1) on apoptosis and spindle formation in human cancer cells. J Natl Cancer Inst 2002;94:1863-77. 123. Faragher AJ, Fry AM. Nek2A kinase stimulates centrosome disjunction and is required for formation of bipolar mitotic spindles. Mol Biol Cell 2003;14:2876-89. 124. Bahmanyar S, Kaplan DD, Deluca JG, Giddings TH Jr, O'Toole ET, Winey M, Salmon ED, Casey PJ, Nelson WJ, Barth AI. beta-Catenin is a Nek2 substrate involved in centrosome separation. Genes Dev 2008;22:91-105. 125. Meraldi P, Sorger PK. A dual role for Bub1 in the spindle checkpoint and chromosome congression. EMBO J 2005;24:1621-33. 126. Dou Z, Liu X, Wang W, Zhu T, Wang X, Xu L, Abrieu A, Fu C, Hill DL, Yao X. Dynamic localization of Mps1 kinase to kinetochores is essential for accurate spindle microtubule attachment. Proc Natl Acad Sci U S A 2015;112:E4546-55. 127. Tang Z, Sun Y, Harley SE, Zou H, Yu H. Human Bub1 protects centromeric sister-chromatid cohesion through Shugoshin during mitosis. Proc Natl Acad Sci U S A 2004;101:18012-7. 128. Tang Z, Shu H, Qi W, Mahmood NA, Mumby MC, Yu H. PP2A is required for centromeric localization of Sgo1 and proper chromosome segregation. Dev Cell 2006;10:575-85. 129. Adams RR, Carmena M, Earnshaw WC. Chromosomal passengers and the (aurora) ABCs of mitosis. Trends Cell Biol 2001;11:49-54. 130. Holland AJ, Lan W, Cleveland DW. Centriole duplication: a lesson in self-control. Cell Cycle 2010;9:2731-6. 131. Bettencourt-Dias M, Hildebrandt F, Pellman D, Woods G, Godinho SA. Centrosomes and cilia in human disease. Trends Genet 2011;27:307-15. 132. Nigg EA, Schnerch D, Ganier O. Impact of centrosome aberrations on chromosome segregation and tissue architecture in cancer. Cold Spring Harb Symp Quant Biol 2018; doi: 10.1101/sqb.2017.82.034421. 133. Lingle WL, Lutz WH, Ingle JN, Maihle NJ, Salisbury JL. Centrosome hypertrophy in human breast tumors: implications for genomic stability and cell polarity. Proc Natl Acad Sci U S A 1998;95:2950-5. 134. Guo HQ, Gao M, Ma J, Xiao T, Zhao LL, Gao Y, Pan QJ. Analysis of the cellular centrosome in fine-needle aspirations of the breast. Breast Cancer Res 2007;9:R48. 135. Salisbury JL, Lingle WL, White RA, Cordes LE, Barrett S. Microtubule nucleating capacity of centrosomes in tissue sections. J Histochem Cytochem 1999;47:1265-74. 136. Lingle WL, Barrett SL, Negron VC, D'Assoro AB, Boeneman K, Liu W, Whitehead CM, Reynolds C, Salisbury JL. Centrosome amplification drives chromosomal instability in breast tumor development. Proc Natl Acad Sci U S A 2002;99:1978-83. 137. D'Assoro AB, Barrett SL, Folk C, Negron VC, Boeneman K, Busby R, Whitehead C, Stivala F, Lingle WL, Salisbury JL. Amplified centrosomes in breast cancer: a potential indicator of tumor aggressiveness. Breast Cancer Res Treat 2002;75:25-34. 138. D'Assoro AB, Lingle WL, Salisbury JL. Centrosome amplification and the development of cancer. Oncogene 2002;21:6146-53. 139. Normand G, King RW. Understanding cytokinesis failure. Adv Exp Med Biol 2010;676:27-55. 140. Krzywicka-Racka A, Sluder G. Repeated cleavage failure does not establish centrosome amplification in untransformed human cells. J Cell Biol 2011;194:199-207. 141. Weaver BA, Silk AD, Cleveland DW. Low rates of aneuploidy promote tumorigenesis while high rates of aneuploidy cause cell death and tumor suppression. Cell Oncol 2008;30:453. 142. Kwon M, Godinho SA, Chandhok NS, Ganem NJ, Azioune A, Thery M, Pellman D. Mechanisms to suppress multipolar divisions in cancer cells with extra centrosomes. Genes Dev 2008;22:2189-203. 143. Quintyne NJ, Reing JE, Hoffelder DR, Gollin SM, Saunders WS. Spindle multipolarity is prevented by centrosomal clustering. Science 2005;307:127-9. 144. Silkworth WT, Nardi IK, Scholl LM, Cimini D. Multipolar spindle pole coalescence is a major source of kinetochore mis-attachment and chromosome mis-segregation in cancer cells. PLoS One 2009;4:e6564. 145. Fujiwara T, Bandi M, Nitta M, Ivanova EV, Bronson RT, Pellman D. Cytokinesis failure generating tetraploids promotes tumorigenesis in p53-null cells. Nature 2005;437:1043-7. 146. Weaver BA, Silk AD, Montagna C, Verdier-Pinard P, Cleveland DW. Aneuploidy acts both oncogenically and as a tumor suppressor. Cancer Cell 2007;11:25-36. 147. Sabino D, Gogendeau D, Gambarotto D, Nano M, Pennetier C, Dingli F, Arras G, Loew D, Basto R. Moesin is a major regulator of centrosome behavior in epithelial cells with extra centrosomes. Curr Biol 2015;25:879-89. 148. Vitre B, Holland AJ, Kulukian A, Shoshani O, Hirai M, Wang Y, Maldonado M, Cho T, Boubaker J, Swing DA, Tessarollo L, Evans SM, Fuchs E, Cleveland DW. Chronic centrosome amplification without tumorigenesis. Proc Natl Acad Sci U S A 2015;112:E6321-30. 149. Marthiens V, Rujano MA, Pennetier C, Tessier S, Paul-Gilloteaux P, Basto R. Centrosome amplification causes microcephaly. Nat Cell Biol 2013;15:731-40. 150. Lee M, Oprea-Ilies G, Saavedra HI. Silencing of E2F3 suppresses tumor growth of Her2+ breast cancer cells by restricting mitosis. Oncotarget 2015;6:37316-34. 151. Schneeweiss A, Sinn HP, Ehemann V, Khbeis T, Neben K, Krause U, Ho AD, Bastert G, Kramer A. Centrosomal aberrations in primary invasive breast cancer are associated with nodal status and hormone receptor expression. Int J Cancer 2003;107:346-52. 152. Denu RA, Zasadil LM, Kanugh C, Laffin J, Weaver BA, Burkard ME. Centrosome amplification induces high grade features and is prognostic of worse outcomes in breast cancer. BMC Cancer 2016;16:47. 153. Pannu V, Mittal K, Cantuaria G, Reid MD, Li X, Donthamsetty S, McBride M, Klimov S, Osan R, Gupta MV, Rida PC, Aneja R. Rampant centrosome amplification underlies more aggressive disease course of triple negative breast cancers. Oncotarget 2015;6:10487-97. 154. Basto R, Brunk K, Vinadogrova T, Peel N, Franz A, Khodjakov A, Raff JW. Centrosome amplification can initiate tumorigenesis in flies. Cell 2008;133:1032-42. 155. Castellanos E, Dominguez P, Gonzalez C. Centrosome dysfunction in Drosophila neural stem cells causes tumors that are not due to genome instability. Curr Biol 2008;18:1209-14. 156. Suizu F, Ryo A, Wulf G, Lim J, Lu KP. Pin1 regulates centrosome duplication, and its overexpression induces centrosome amplification, chromosome instability, and oncogenesis. Mol Cell Biol 2006;26:1463-79. 157. Wang X, Zhou YX, Qiao W, Tominaga Y, Ouchi M, Ouchi T, Deng CX. Overexpression of aurora kinase A in mouse mammary epithelium induces genetic instability preceding mammary tumor formation. Oncogene 2006;25:7148-58. 158. Coelho PA, Bury L, Shahbazi MN, Liakath-Ali K, Tate PH, Wormald S, Hindley CJ, Huch M, Archer J, Skarnes WC, Zernicka-Goetz M, Glover DM. Over-expression of Plk4 induces centrosome amplification, loss of primary cilia and associated tissue hyperplasia in the mouse. Open Biol 2015;5:150209. 159. Sercin O, Larsimont JC, Karambelas AE, Marthiens V, Moers V, Boeckx B, Le Mercier M, Lambrechts D, Basto R, Blanpain C. Transient PLK4 overexpression accelerates tumorigenesis in p53-deficient epidermis. Nat Cell Biol 2016;18:100-10. 160. Levine MS, Bakker B, Boeckx B, Moyett J, Lu J, Vitre B, Spierings DC, Lansdorp PM, Cleveland DW, Lambrechts D, Foijer F, Holland AJ. Centrosome amplification is sufficient to promote spontaneous tumorigenesis in mammals. Dev Cell 2017;40:313-22.e5. 161. Godinho SA, Picone R, Burute M, Dagher R, Su Y, Leung CT, Polyak K, Brugge JS, Thery M, Pellman D. Oncogene-like induction of cellular invasion from centrosome amplification. Nature 2014;510:167-71. 162. Lee M, Oprea-Ilies G, Saavedra HI. Silencing of E2F3 suppresses tumor growth of Her2+ breast cancer cells by restricting mitosis. Oncotarget 2015;6:37316-34. 163. Schnerch D, Nigg EA. Structural centrosome aberrations favor proliferation by abrogating microtubule-dependent tissue integrity of breast epithelial mammospheres. Oncogene 2016;35:2711-22. 164. Casenghi M, Meraldi P, Weinhart U, Duncan PI, Korner R, Nigg EA. Polo-like kinase 1 regulates Nlp, a centrosome protein involved in microtubule nucleation. Dev Cell 2003;5:113-25. 165. Shao S, Liu R, Wang Y, Song Y, Zuo L, Xue L, Lu N, Hou N, Wang M, Yang X, Zhan Q. Centrosomal Nlp is an oncogenic protein that is gene-amplified in human tumors and causes spontaneous tumorigenesis in transgenic mice. J Clin Invest 2010;120:498-507. 166. Yu L, Song Y, Zhang Q, Zhan Q. Ninein-like protein is overexpressed in head and neck squamous cell carcinoma and contributes to cancer growth and resistance to apoptosis. Oncol Rep 2009;22:789-98. 167. Qu D, Qu H, Fu M, Zhao X, Liu R, Sui L, Zhan Q. Increased expression of Nlp, a potential oncogene in ovarian cancer, and its implication in carcinogenesis. Gynecol Oncol 2008;110:230-6. 168. Ganier O, Schnerch D, Oertle P, Lim RY, Plodinec M, Nigg EA. Structural centrosome aberrations promote non-cell-autonomous invasiveness. EMBO J 2018;37:e98576. 169. Fukasawa K, Choi T, Kuriyama R, Rulong S, Vande Woude GF. Abnormal centrosome amplification in the absence of p53. Science 1996;271:1744-7. 170. Fodde R, Kuipers J, Rosenberg C, Smits R, Kielman M, Gaspar C, van Es JH, Breukel C, Wiegant J, Giles RH, Clevers H. Mutations in the APC tumour suppressor gene cause chromosomal instability. Nat Cell Biol 2001;3:433-8. 171. Tutt A, Gabriel A, Bertwistle D, Connor F, Paterson H, Peacock J, Ross G, Ashworth A. Absence of Brca2 causes genome instability by chromosome breakage and loss associated with centrosome amplification. Curr Biol 1999;9:1107-10. 172. Wang X, Wang RH, Li W, Xu X, Hollander MC, Fornace AJ Jr, Deng CX. Genetic interactions between Brca1 and Gadd45a in centrosome duplication, genetic stability, and neural tube closure. J Biol Chem 2004;279:29606-14. 173. Ishida S, Huang E, Zuzan H, Spang R, Leone G, West M, Nevins JR. Role for E2F in control of both DNA replication and mitotic functions as revealed from DNA microarray analysis. Mol Cell Biol 2001;21:4684-99. 174. Harrison Pitner MK, Saavedra HI. Cdk4 and nek2 signal binucleation and centrosome amplification in a her2+ breast cancer model. PLoS One 2013;8:e65971. 175. Leontovich AA, Salisbury JL, Veroux M, Tallarita T, Billadeau D, McCubrey J, Ingle J, Galanis E, D'Assoro AB. Inhibition of Cdk2 activity decreases Aurora-A kinase centrosomal localization and prevents centrosome amplification in breast cancer cells. Oncol Rep 2013;29:1785-8. 176. Leone G, DeGregori J, Sears R, Jakoi L, Nevins JR. Myc and Ras collaborate in inducing accumulation of active cyclin E/Cdk2 and E2F. Nature 1997;387:422-6. 177. Iovino F, Lentini L, Amato A, Di Leonardo A. RB acute loss induces centrosome amplification and aneuploidy in murine primary fibroblasts. Mol Cancer 2006;5:38. 178. Chen HZ, Tsai SY, Leone G. Emerging roles of E2Fs in cancer: an exit from cell cycle control. Nat Rev Cancer 2009;9:785-97. 179. Kuznetsova AY, Seget K, Moeller GK, de Pagter MS, de Roos JA, Durrbaum M, Kuffer C, Muller S, Zaman GJ, Kloosterman WP, Storchova Z. Chromosomal instability, tolerance of mitotic errors and multidrug resistance are promoted by tetraploidization in human cells. Cell Cycle 2015;14:2810-20. 180. Sotillo R, Schvartzman JM, Socci ND, Benezra R. Mad2-induced chromosome instability leads to lung tumour relapse after oncogene withdrawal. Nature 2010;464:436-40. 181. Hingorani SR, Wang L, Multani AS, Combs C, Deramaudt TB, Hruban RH, Rustgi AK, Chang S, Tuveson DA. Trp53R172H and KrasG12D cooperate to promote chromosomal instability and widely metastatic pancreatic ductal adenocarcinoma in mice. Cancer Cell 2005;7:469-83. 182. McCreery MQ, Halliwill KD, Chin D, Delrosario R, Hirst G, Vuong P, Jen KY, Hewinson J, Adams DJ, Balmain A. Evolution of metastasis revealed by mutational landscapes of chemically induced skin cancers. Nat Med 2015;21:1514-20. 183. Duesberg P, Li R, Sachs R, Fabarius A, Upender MB, Hehlmann R. Cancer drug resistance: the central role of the karyotype. Drug Resist Updat 2007;10:51-8. 184. McGranahan N, Burrell RA, Endesfelder D, Novelli MR, Swanton C. Cancer chromosomal instability: therapeutic and diagnostic challenges. EMBO Rep 2012;13:528-38. 185. Shapiro JR, Mehta BM, Ebrahim SA, Scheck AC, Moots PL, Fiola MR. Tumor heterogeneity and intrinsically chemoresistant subpopulations in freshly resected human malignant gliomas. Basic Life Sci 1991;57:243-61; discussion 261. 186. Zhou YH, Chen Y, Hu Y, Yu L, Tran K, Giedzinski E, Ru N, Gau A, Pan F, Qiao J, Atkin N, Ly KC, Lee N, Siegel ER, Linskey ME, Wang P, Limoli C. The role of EGFR double minutes in modulating the response of malignant gliomas to radiotherapy. Oncotarget 2017;8:80853-68. 187. Hu Y, Ru N, Xiao H, Chaturbedi A, Hoa NT, Tian XJ, Zhang H, Ke C, Yan F, Nelson J, Li Z, Gramer R, Yu L, Siegel E, Zhang X, Jia Z, Jadus MR, Limoli CL, Linskey ME, Xing J, Zhou YH. Tumor-specific chromosome mis-segregation controls cancer plasticity by maintaining tumor heterogeneity. PLoS One 2013;8:e80898. 188. Heerema NA, Sather HN, Sensel MG, Zhang T, Hutchinson RJ, Nachman JB, Lange BJ, Steinherz PG, Bostrom BC, Reaman GH, Gaynon PS, Uckun FM. Prognostic impact of trisomies of chromosomes 10, 17, and 5 among children with acute lymphoblastic leukemia and high hyperdiploidy (> 50 chromosomes). J Clin Oncol 2000;18:1876-87. 189. Rivera-Rivera Y, Saavedra HI. Centrosome - a promising anti-cancer target. Biologics 2016;10:167-76. 190. Marina M, Saavedra HI. Nek2 and Plk4: prognostic markers, drivers of breast tumorigenesis and drug resistance. Front Biosci (Landmark Ed) 2014;19:352-65. 191. Finn RS, Aleshin A, Slamon DJ. Targeting the cyclin-dependent kinases (CDK) 4/6 in estrogen receptor-positive breast cancers. Breast Cancer Res 2016;18:17. 192. Finn RS, Crown JP, Lang I, Boer K, Bondarenko IM, Kulyk SO, Ettl J, Patel R, Pinter T, Schmidt M, Shparyk Y, Thummala AR, Voytko NL, Fowst C, Huang X, Kim ST, Randolph S, Slamon DJ. The cyclin-dependent kinase 4/6 inhibitor palbociclib in combination with letrozole versus letrozole alone as first-line treatment of oestrogen receptor-positive, HER2-negative, advanced breast cancer (PALOMA-1/TRIO-18): a randomised phase 2 study. Lancet Oncol 2015;16:25-35. 193. Finn RS, Dering J, Conklin D, Kalous O, Cohen DJ, Desai AJ, Ginther C, Atefi M, Chen I, Fowst C, Los G, Slamon DJ. PD 0332991, a selective cyclin D kinase 4/6 inhibitor, preferentially inhibits proliferation of luminal estrogen receptor-positive human breast cancer cell lines in vitro. Breast Cancer Res 2009;11:R77. 194. Dean JL, Thangavel C, McClendon AK, Reed CA, Knudsen ES. Therapeutic CDK4/6 inhibition in breast cancer: key mechanisms of response and failure. Oncogene 2010;29:4018-32. 195. Goldberg SL, Fenaux P, Craig MD, Gyan E, Lister J, Kassis J, Pigneux A, Schiller GJ, Jung J, Jane Leonard E, Fingert H, Westervelt P. An exploratory phase 2 study of investigational Aurora A kinase inhibitor alisertib (MLN8237) in acute myelogenous leukemia and myelodysplastic syndromes. Leuk Res Rep 2014;3:58-61. 196. Komarova NL, Wodarz D. The optimal rate of chromosome loss for the inactivation of tumor suppressor genes in cancer. Proc Natl Acad Sci U S A 2004;101:7017-21. 197. Weaver BA, Cleveland DW. Aneuploidy: instigator and inhibitor of tumorigenesis. Cancer Res 2007;67:10103-5. 198. Jamal-Hanjani M, A'Hern R, Birkbak NJ, Gorman P, Gronroos E, Ngang S, Nicola P, Rahman L, Thanopoulou E, Kelly G, Ellis P, Barrett-Lee P, Johnston SR, Bliss J, Roylance R, Swanton C. Extreme chromosomal instability forecasts improved outcome in ER-negative breast cancer: a prospective validation cohort study from the TACT trial. Ann Oncol 2015;26:1340-6. 199. Janssen A, Kops GJ, Medema RH. Elevating the frequency of chromosome mis-segregation as a strategy to kill tumor cells. Proc Natl Acad Sci U S A 2009;106:19108-13. 200. Shackney SE, Silverman JF. Molecular evolutionary patterns in breast cancer. Adv Anat Pathol 2003;10:278-90. 201. Lee HS, Lee NC, Kouprina N, Kim JH, Kagansky A, Bates S, Trepel JB, Pommier Y, Sackett D, Larionov V. Effects of anticancer drugs on chromosome instability and new clinical implications for tumor-suppressing therapies. Cancer Res 2016;76:902-11. 202. Vargas-Rondon N, Villegas VE, Rondon-Lagos M. The role of chromosomal instability in cancer and therapeutic responses. Cancers (Basel) 2017;10:E4.